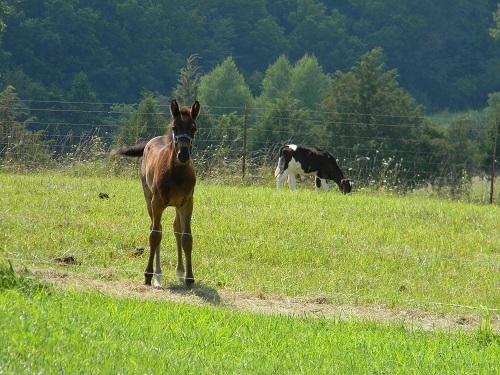 Willow the filly and Bartholomew the calf are growing up so fast! I can hardly believe that they are already 1 month and 2 1/2 months old! My summer has been filled to the brim. Last week my Wally (my angora billy goat) was droopy to the point that I actually took him to the vet. Turns out he is anemic due to parasites. The parasites were immune to the dewormer I had used. Today I made homemade fly spray using Listerine, vinegar, oil, dish soap, and water…it didn’t turn out that well so if any of you have a good homemade recipe I could sure use it! My church could use your prayers. We need revival. Some want it, but there are some that don’t want to put the effort into it. Pray that those who do want it will have the strength to move forward regardless.